Ellie Rose has turned out to be wonderful and beautiful in every way! She has passed her first test towards becoming a certified Pet Therapy dog. She is so much fun and a crazy girl! 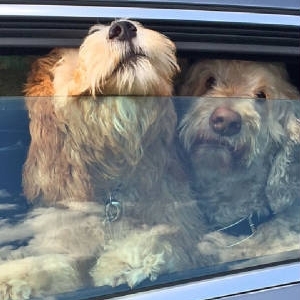 You may recall we lost our beloved labradoodle, also from GlenEden, suddenly last May and did not believe we could ever love another dog again. Ellie has totally won our hearts and healed them. Her hair is gorgeous and everyone comments on it. She only weighs around 36lbs. We purchased a Labradoodle puppy, Sunny in December, 2010. She has a red coat. Miraculously, my husband has no allergies with Sunny. Recently, we have been temporarily caring for a family members dog and can see how much Sunny enjoys the company. Beau is leaving soon and we would like to purchase another female Labradoodle. Here’s Beau in all his glory. He’s acclimated to life up here in the Northeast very well. He loves everyone and everyone loves him. We live in a loft where there are 25 apartments, many kids and many dogs. Do I need to tell you who’s the cutest of them all-don’t think so! I remember writing to you because he wasn’t eating well. He now would eat the ranch if we let him. Everyday is another special one with Beau. He keeps us on our toes and laughing like crazy. 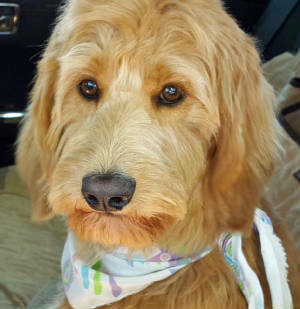 He’s our second amazing Labradoodle from Gleneden and we’re very grateful for your special pups. It is hard to believe what a joy he is and how fast he has grown in the 2 months he has been a part of our family. 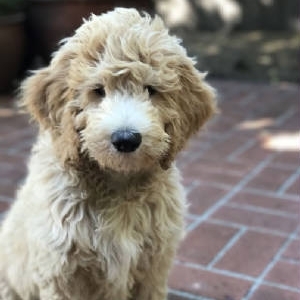 He is very smart, affectionate, and..yes a pup, but we know he will be a wonderful companion for us and even a future labradoodle. He is enrolled in the local Nursing Home to visit the residents and bring some joy to their lives, as he has ours. My kids wanted me to send u pictures of both our dogs we got from u. They would love to see them on ur website. 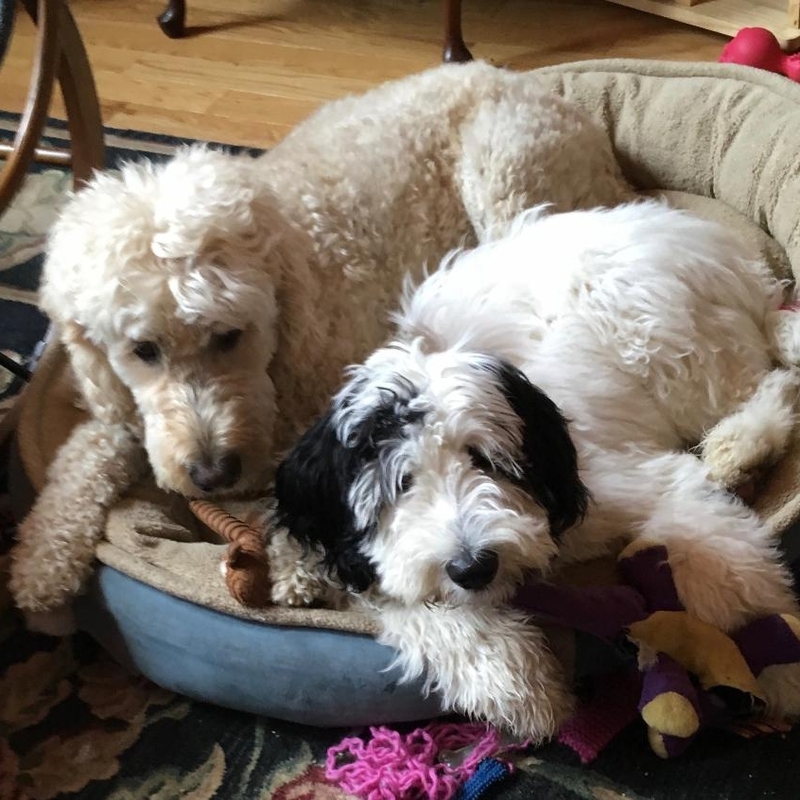 Teddy (our Goldendoodle) is 5 months old and Cody (our labradoodle) is 9 1/2 years old. Teddy is very, very active and so darn cute. The puppy loves his big brother, Cody. Cody is just getting used to his baby brother. Cody is afraid to close his eyes cause he is afraid he will miss something the puppy is getting. the best, cutest, most loving paw spirit.